（1）Long style. Elegant retro stand collar design, Pretty up neck. Straight placket, Retro manual knitted buttons. Comfortable shoulder design.Cuff blank pressing; Cuff leveling. Side slit with Retro manual knitted buttons; Hem blank pressing; Hem edge leveling. （2）Material：92% mulberry silk (watered gauze) ; 8%polyurethane fibre. Lining： 100% Polyester fibre. Filler：100% silk wadding. Color：99-1, 99-2, 99-6. 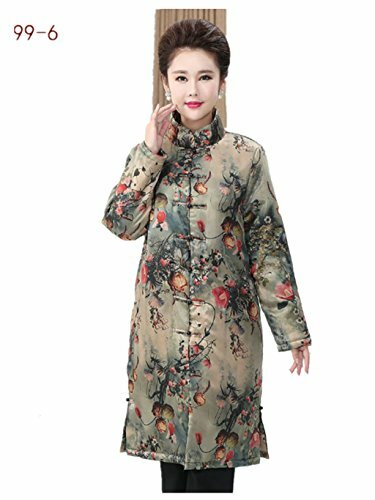 （3）Long style; Double-deck; thickened; keep warmer ; good softness; nonelastic; durable; Stereoscopic cutting; Beautify the body; Printing pattern ; Outside one pocket on each side; the appearance is elegant and tasty. （4）Suitable for Winter. Suitable for Various formal occasions: wedding, meeting, business, office, reception, party, banquet, Leisure, time Home. （5）IMPORTANT REMINDER: Please check REFERENCE SIZE to confirm your size, and email us your selected size and style and color when you order. We will shipping the goods to you in accordance with the information you provided。。。。。.If no information is confirmed, we will ship it to you according to the default color, style and size of the product. If you have any questions about this product by Womens Tang Suit, contact us by completing and submitting the form below. If you are looking for a specif part number, please include it with your message.